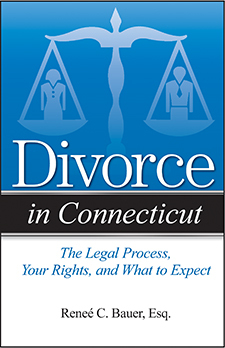 Are You Getting a Divorce in Connecticut? Fortunately, Attorney Reneé C. Bauer understands your need to know. During her decade of practicing law, she has helped hundreds of individuals navigate the maze of divorce. In Divorce in Connecticut she answers not only the questions on your mind but also those you may not have thought to ask. What is the mediation process and does Connecticut require that my spouse and I go through it? How quickly can I get a divorce in Connecticut? Watch WTNH News 8 Interview with author Reneé Bauer here. Read The Middletown Press interview here. Read an article from the Hartford Courant here.